Before Donald Trump fired James Comey, Senators Patrick Leahy and Al Franken had asked the FBI to investigate Jeff Sessions for possible perjury pertaining to Sessions' alleged undisclosed contact/meetings with the Russian Ambassador, Sergey Kislyak. 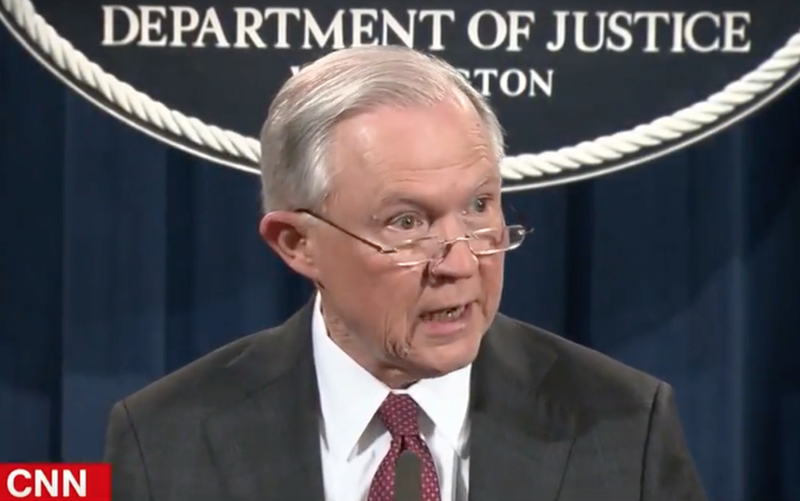 Beginning at 0:44 in the above video, Jeff Session says, "I never had meetings, with Russian operatives, or Russian intermediaries about the Trump campaign ..."
During 0:46 - 0:47, as he says,"Russian operatives" - Sessions shifts his weight rapidly from side-to-side (to his left, then back to his right). Then, just a few seconds later, during 0:49 - 0:50, as he says, "intermediaries", the US Attorney General elevates quickly up-and-down on his toes. Both of these nonverbal actions are highly indicative of adrenaline surges which accompany anxiety. However, when viewed in the context of this crucial, high-ramification denial declarative, their presence dramatically increases the probability that deception has occurred. Please view the video as still images don't capture the dynamics and the subtlety of movement.